AVE YOU EVER HAD A LONG DAY? Maybe it was a rough day at work or a tough day at school. Maybe you were sick or tired. At the end of a long day, you only want a couple of things. You might want to sit down and take off your shoes. You might want to take a hot, relaxing shower. And, more than likely, you’ll want something to eat. If you’ve ever been in that position, then you know something of what it was like for Jesus during His temptation in the desert. St. Luke tells us that Jesus hiked from the Jordan River, where He was baptized, into the desert. He spent forty days and forty nights there, in the wilderness, and He undertook a fast the entire time. Imagine how hungry you would be if you fasted for forty days and forty nights! At the end of that time, Satan walks onto the scene. What does he say? “If you were really God, You could turn stones into bread to eat.” Of course, the amazing truth is that, yes, Jesus could actually do that! He could turn stones into bread very easily. But He won’t do it. He refuses. Why? Because Jesus wants to experience everything we experience as humans—even hunger. The devil’s temptation is cunning, but Jesus refuses to satisfy His stomach so that He could share in our suffering. What does the devil try next? He says, “If you were God, You could throw Yourself off a cliff and command the angels to catch You.” Again, yes, indeed, He could. But He again chooses not to. Jesus has lots of power, but the purpose of His power is not to impress people or merely entertain them. So, again, Jesus shows His true strength by actually showing restraint. He shows His true power by withholding His power. But the devil comes back once more. This time, he leads Jesus up a high mountain. One of the things I love to do is go camping and backpacking, so I’ve had the opportunity to climb numerous mountains. If you’ve ever done it yourself, then you know it’s an amazing experience. You may think you’re in the middle of nowhere, but when you stand on the very top of a tall mountain, you can see towns & villages & cities for a hundred miles or more. It’s easy to feel like you’re the “King of the Hill.” It’s easy to feel like you have power over everything you can see. That is the false sense of power that Satan uses to tempt Jesus. He says, “If you just worship me, I’ll give you power over all the kingdoms of the world.” I suspect we’ve all had that very same temptation come our way. When their children are very young, parents have lots of control over what they do and what they wear and what they eat. As fun & beautiful as it is to watch children grow, it is hard to let go of our control and give them greater independence. Or maybe sometime you received a promotion at work. The more people there are below us, the more tempting it is to think that we have power over them. It can make us feel good when we think we have minions. But that’s not what the best leaders are like, is it? The best parents and bosses you’ve ever known aren’t the ones who lord their power over you. They’re the ones who seek to serve—the ones who look out for the best interests of their children and their employees. Didn’t we see such a great example earlier this week, when our Holy Father, Pope Benedict XVI, announced his decision to resign as our Holy Father. The pope has authority and exercises leadership over more than a billion people across the globe. It must be tempting to hold on to that “power.” But, in a great act of courage and humility, Pope Benedict has chosen to set that power aside, for the greater good of the Church. Truly good leaders are humble. They are servants. 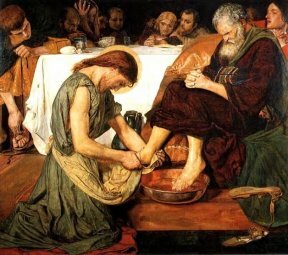 The Church has taught for centuries that humility is the root virtue. Without humility, in other words, it’s impossible to demonstrate any other virtue. It’s impossible to show courage or patience or wisdom if we do not possess humility. It’s impossible to show loyalty or purity or generosity if we don’t first show forth humility. We are right at the beginning of Lent. What a great thing it would be if we could all grow in humility throughout this holy season. In our prayers & fasting & almsgiving, let’s ask for the grace to be inspired: by the humble example of the good parents and employers we’ve known; by the humble example of our Holy Father; and by the example Jesus Christ, Who is the very model of humility.